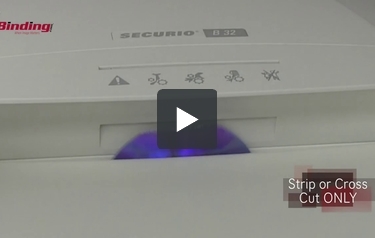 The HSM Securio B32c Level 4 Micro-cut Shredder is a perfect solution for busy offices in securing their important documents. Capable of shredding up to 11-13 sheets of paper, can create 2,116 micro-cut particles per page, has a 21.7-gallon capacity of waste bin and an inspection window to monitor filling level. The HSM Securio B32c is perfect for shredding of tax documents, bank statements, and medical bills. It can also shreds staples, paper clips, and credit/store cards. This shredder has a JamStop Anti-Jam Technology feature that prevents jams when machine is overloaded and can work continuously with no down time. Be smart and own a shredder! Choose this HSM Securio B32c Level 4 Micro-cut Shredder for protecting your important files in your office or home. HSM Level 4 shredders are a special order with a lead time of 8-10 weeks. They are made to order and therefore are non-cancellable. Cutting size: 1/16" x 9/16"
Welcome to MyBinding video. Let's have a look at the SECURIO B32 by HSM. This shredder is ideal for the busy office. It stands proud, strong and is quite the workhorse. It comes in 3 different shred patterns - strip, cut and micro-cut, each increasing in its security level. In terms of shred capacity, this shredder can strip at 30 sheets, cross-cut at 19 and micro-cut at 13 sheets of 20-pound paper in a single pass and the strip and cross-cut models only can handle CDs and DVDs as well and for all three models, paper, cardstocks, laminated materials, paperclips, staples and credit cards are all fine for this specially hardened steel cutting rollers. It stands just over 31 inches tall, has a front door opening into a 21.7 gallon box. It's perfect for shredding tax documents, bank statements, medical bills and all things secure. It's built solid, weighs 56 pounds but is on rollers to move around the office with ease, even on carpeted surfaces. There it is. That's the HSM SECURIO B32. For more demos, reviews and how to's, check out MyBinding.com. Cutting Size 1/16" x 9/16" 1/16" x 9/16" 1/16" x 9/16" 1/16" x 9/16" 1/16" x 9/16" 1/16" x 9/16"